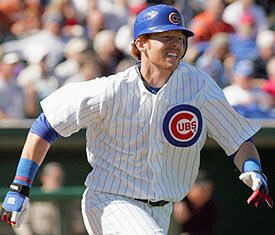 It’s taken me a few days to come to terms with the fact that Matt Murton is no longer a member of the Chicago Cubs. Although I knew it was going to happen, I didn’t expect it to happen this early in July. It’s hard to put your feelings into words when things like this happen. Even though my favorite Cub is no more, I can say that there are some positives that come out of this trade. First of all, I think Matt Murton would be of value to teams. I think he would start on a lot of Major League clubs, but there just wasn’t a whole lot of room in the Cubs outfield for him. This is Murton’s 4th season of bouncing between Iowa and Chicago. I’m sure he could tell me some great places to eat along Interstate 80. This move is probably good for Matt’s career. After looking at the A’s outfield, I’m assuming he’ll get more playing time with them. Another great thing about this trade is that the Cubs organization is finally Patterson free! I challenge anyone to convince me that the Cubs are not better off without a Patterson on the roster. So we knew it was coming. There was no avoiding it and now it’s over. I see nothing negative about this trade. In all honesty, Murton and Patterson offered no more than any other Triple A outfielder could provide. I think Gallagher has a bright future. But the Cubs are closer now than they ever have been and they need to put all their eggs in one basket. Live in the now, Cubs fans. But Harden will be with the Cubs next year and Sabathia will, most likely, not be in Milwaukee. I admire their effort, but I think the Brewers come up short in the present and the future. If Harden can stay healthy, I think he has drastically improved the Cubs playoff pitching situation. I don’t pay a whole lot of attention to the American League outside of Sportscenter, so I really don’t know much about Harden. I guess the key is for him to stay healthy. I look forward to many jokes about his name. I’m assuming Rich is short for Richard. I would say about half of the times I’ve heard people say his name, I have heard the word “Retarded” instead of Rich Harden. But I think Hendry has made a good move. I like most of the moves that Hendry makes this time of year. Who could forget the trade with the Pirates in 2003 that brought the Cubs Aramis Ramirez, Randall Simon and Kenny Lofton for Jose Hernandez? In my opinion, that trade clinched the division for the Cubs. So I trust Hendry and I currently don’t see anything wrong with this trade. I now face the challenge of picking a new favorite Cubs player. I’m leaning towards Derosa or Theriot. This isn’t a decision I can just jump into, though. Do you, the average Ivy Envy reader, have any advice for me in this? I am not drawn to players that are flashy or even popular. I won’t consider Ramirez or Soriano. However, my pro-Ramirez post is coming. Expect it over the All-Star break. This is a big step for me. Matt Murton, I will miss your swinging bunts and awkward feet-first slides at the ball in Left Field. Keep your chin up and we’ll see you down the road, my friend. i’d definitely choose derosa. he’s my favorite!! Theriot is awesome too, though. i miss murton! i feel your pain. 😦 i was so sad when i heard about him getting traded! and his hair’s going to clash with his uniform!! but he’ll probably be better off because it seems he’s going to get more playing time in oakland.